MPR: The Hennepin theater hand-off: "The political dance"
Galligan: Competing proposals "never carefully dissected"
The Hennepin theater hand-off: "The political dance"
It has been nearly two years since Minneapolis began a process to hand off the city's historic Orpheum, State, and Pantages theaters. In November the City Council voted to work out a 30-year deal with the current management, plus a new partner with major financial heft: Clear Channel. In this second of a two-part report, we look at whether the future of the Hennepin theaters was decided by careful analysis -- or by a process at City Hall that was something less than fair and open. Minneapolis, Minn. — When the Minneapolis City Council decided in 2003 to farm out the long-term management -- and maybe ownership -- of its historic theaters, three bids answered the call. One came from a Chicago management and production company called TheatreDreams. One was from the non-profit Ordway Center for the Performing Arts, based in St. Paul. And one was from a three-part team known as HTT/HTG/CCE -- Hennepin Theatre Trust, Historic Theatre Group, and Clear Channel Entertainment. The Council voted in November to negotiate exclusively with that last group. Assuming they reach a deal, the transition should be smooth; variations on this group have essentially run the theaters since 1991. The negotiated deal could return to the Council later this month for a final vote. Minneapolis officials disagree on whether that process was free and fair, as it was purported to be, or whether the Clear Channel bid was essentially preordained. Council President Paul Ostrow believes the city made a crucial mistake by delegating its analysis to an ad-hoc committee of four Council members and assorted staff. "In terms of being preordained, it was really the fact that you had both staff and a number of Council members that right out of the gate were making a specific recommendation," he says. "And I think that really did give it a lot of momentum before it really got to the rest of the Council." In other words, Ostrow and others believe the ad hoc committee assigned to study the issue wound up doing more advocacy than analysis. Council Member Scott Benson was on that ad-hoc committee that recommended going with the Clear Channel bid. "I'm not sure, at least from my perspective, that it was preordained," Benson says. "I actually think it was an excellent process from the perspective that we started eight months before the decision with a study group format to learn more about the industry and to learn more about the contract that we currently had, and how the theaters started." The study group did spend plenty of time learning about the current operating team. They had been making their pitch for more than a year before the two competing bids formally arrived, when there was just a month to go in the process. But Benson says the proposals were evaluated fairly, on their merits. He says the track record of the current operators, along with the financial muscle of Clear Channel, convinced him their bid was the smarter choice. Benson denies feeling any influence from one powerful study group member, Council Member Lisa Goodman. Goodman's ward boundary includes downtown Hennepin Avenue, and she is both knowledgeable and passionate on the theaters issue. Goodman is on-record initially opposing open bidding for the theaters contract. Yet as chair of two important committees and a member of the ad-hoc study group, she was at the center of evaluating the bids. Goodman declined an interview for this story. She did offer one comment, saying the only reason the story is getting any attention at the moment is because of sour grapes from officials at the Ordway -- a losing bidder. "It's unfortunate they have bad feelings about it because they didn't get picked," she said. "But we're in a negotiation now and this is a binding process." Ordway officials say they don't intend to dwell in the past, but do have some issues with the process. Board Vice Chair Jeff Bakken says he knew the Ordway's plan to manage the theaters as part of a regional theater system faced an uphill battle across the river in Minneapolis. "The outcome was not unexpected. The political dance was not unexpected. We wanted to use it as an opportunity to do this research, to raise our visibility in the Cities, to make clear to people what our mission is," Bakken says. "And we accomplished a lot of that in the process." The Ordway might have done further damage to its chances with a public relations campaign gone awry. At one point last year, a sharply-worded letter circulated by email, accusing the City Council of handing the theaters directly to Clear Channel. It was later traced to Ordway sources, and officials apologized for creating confusion among Council members and the public. But Ordway CEO David Galligan says the process itself kept his plan from a full and fair hearing. "Even to the very last moment there was still a great deal of confusion about the facts," he says. "And I'm not sure the competing proposals were ever carefully dissected and set up one against the other." City Council Member Scott Benson, who served on the study group that evaluated the proposals, says the analysis was there for anyone who cared to look. "The frustration was, it was never an apples-to-apples comparison because they didn't offer the same things. All three of the proposals we received were different. It could never have been boiled down to clear-cut for people, and there was some frustration on behalf of some," Benson said. "The way things work around here"
That frustration was certainly felt by Benson's colleague, Council Member Paul Zerby. Zerby believes the full Council was denied the whole story by the members of the task force. "Not to denigrate in any way the members of the task force -- they're very capable people," Zerby says. "But the process came back in a kind of 'trust-us' kind of way, that didn't really allow for the full, unflinching scrutiny and analysis by the Council as a body that I would have liked to have seen." The process came back in a kind of 'trust-us' kind of way, that didn't really allow for...full, unflinching scrutiny and analysis. Zerby and four colleagues called unsuccessfully for three extra weeks for that analysis. But other members felt the process had gone on long enough. Zerby says strong proponents of the Clear Channel group were able to build momentum into the process itself, and that was difficult for many council members to resist. "You're sort of met with, 'Well, the train has left the station, this is rolling on ahead, let's not throw debris on the tracks. Let's get on board and get it done,'" Zerby says. "I don't know that there's anything sinister about it. That's just the kind of human dynamic and the way things work around here a lot." The process by which the theater decision was made is no shock to those who know City Hall, and totally legal. But it seems more problematic in light of the questions still unanswered when the city decided to negotiate with the Clear Channel team: How can the skeletal non-profit that fronts the group grow into the civic engine city officials envision? What mechanisms will keep Clear Channel from becoming a de-facto owner and operator of the theaters? And did Clear Channel have plans already to buy out the local for-profit component of the team? Leaders of the team -- its local elements, as well as Clear Channel -- declined requests to address these questions. They cited a need to respect their negotiations with the city, which face a March 19th deadline. At that point, city officials will again have a say -- though they'll have little chance, if any, to modify the deal reached by city staff. Some who supported the Clear Channel bid say they are still prepared to vote against the contract if it does not meet standards for transparency, community programming and local control of the theaters. Among them is Minneapolis Mayor R.T. Rybak. "I think it's important to always ask the tough questions," he says. "But I'm very comfortable that the people who spent close to year in a series of meetings, including my top policy aide, were able to make the tough decisions. We'll keep asking the tough questions. But I think this was a good process, and one that we're going to be proud of as we look back." Skeptics in and outside City Hall believe the deal will garner a majority even if many Council members' concerns fall by the wayside. In that case, they say the best taxpayers and officials can hope for is to learn from the process. There could be valuable lessons as Minneapolis moves to subject more contracts of all kinds to open bidding and public scrutiny. 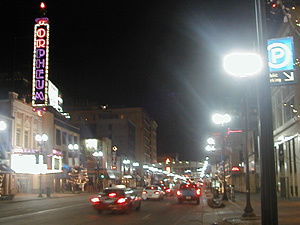 On Tuesday March 8, in a report on the transfer of three Hennepin Avenue Theaters to a group including Clear Channel, Minnesota Public Radio reported incorrectly that members of that group held a fundraiser for Minneapolis Council Member Lisa Goodman. Minnesota Public Radio regrets the error.